Chemical jetting process is the necessary process for the oily sludge separation for refinery oil tank bottom cleaning, drilling waste oil sludge, mechanical separation itself can not meet the target after treatment, mechanical separation with chemical jetting is the ideal separation process for oil sludge separation. 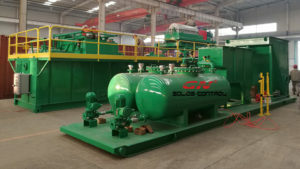 GN solids control design and produced oil sludge separation system is with the same working process, we welcome clients who need a customized solution for oil recovery, oil sludge separation, to send us a bottle of sample for test, and give you proper chemical jetting proposal and mechanical separation system proposal. Pls contact our sales@gnsolidscontrol.com for the suggestion. Water circulation system to provide water for washing and provide hot water to the mud tank heating line to keep the temperature up to 60 ℃. This is the 6th time for GN solids control to show at OTC in Houston, and this is the 3rd time for GN solids America to participate the show, we start to show our decanter centrifuge at OTC since 2012, when our USA branch office is still in preparation. Hydraulic drive decanter centrifuge: GN VFD decanter centrifuge has been widely used in drilling waste management system, oil sludge separation system, solids control system and waste water treatment. The hydraulic drive centrifuge is can be used in some area when electricity is limited, could be another option. New developed shale shaker: Different with the traditional shale shaker, the new technology shaker screens can save the shaker screen replacement time for easy operation. 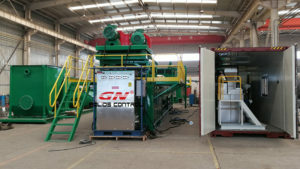 Updated shaker screens: Since June of 2016, we start the production of shaker screens in our new factory in Beijing, we introduced new shaker screens production line, especially for the production of composite material shaker screens, replacement screens for most of the other brand shale shakers. (1) Oil sludge separation: the VFD decanter centrifuge can separate ultra fine solids from the oil water mixture fluids by adding chemicals, then feed to the 3 phase separation system. 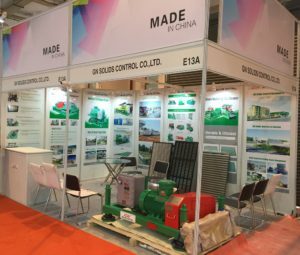 (2) Drilling waste management system: VFD decanter centrifuge can separate fine solids from the drilling fluids discharged from the vertical cuttings dryer, the solids content in the cuttings discharged by the vertical cuttings dryer is under 5%. 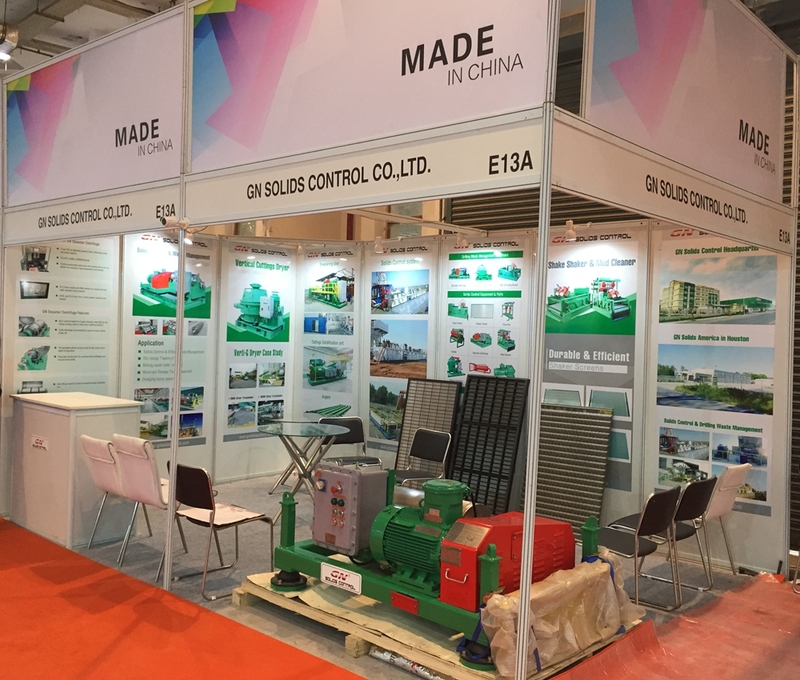 (3) Solids control system: high speed decanter centrifuge can separate barite from the drilling fluids, to reuse the barite can save huge cost for the drilling company, also it can separate the low gravity solids from the drilling fluids to reuse the drilling fluids. (4) Waste water treatment: with dewatering unit and polymer dosing system, the decanter centrifuge can separate solids from waste water as thickening centrifuge. The solids discharged from the decanter centrifuge is dry enough like a cake, you can adjust the humidity of the discharged solids by adjust the pond depth plate on the big end of the centrifuge bowl. 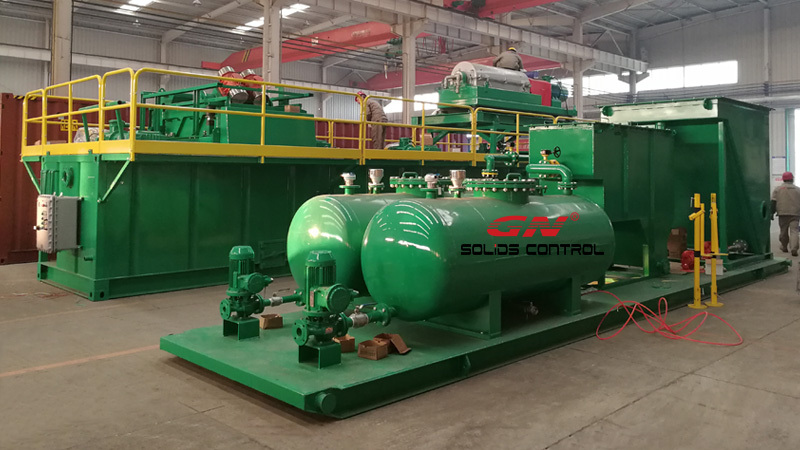 GN solids control have decanter centrifuge in stock both in our China facility and Houston warehouse, welcome to contact GN solids control for purchasing. 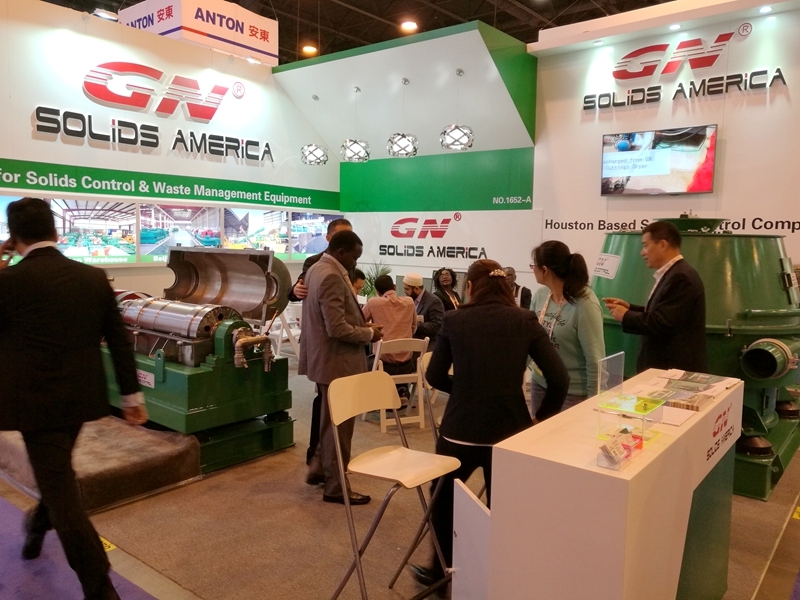 Before feeding to decanter centrifuge, if the solids content is over 30% or there is big solids size over 2mm, pls use GN high G force shale shaker to reduce the solids content firstly.